After more than 25 seasons, there's not a whole lot about the residents of Springfield, USA, that we don't already know. Or so you'd think. But it turns out, a number of the town's most notable and famous residents are not entirely who they seem. Numerous characters on The Simpsons have suffered identity crises over the years. Usually it's Homer, who's adopted the names Rock Strongo and Guy Incognito. among many others. But it's happened to other people as well! Remember when Krusty was once jailed in a case of mistaken identity and later used an assumed name to try to evade rightful punishment. (More on that later.) It turns out, even the town's esteemed founder may have been living a secret double life with another name. Why does The Simpsons keep returning to the notion of alter-egos and alternate identities so often? Because the writers sometimes get lazy and re-use gags that worked the first time around, especially because, after so many episodes, only total dorkfaces like myself would even remember? Of course not, silly. It's tapping in to the fantasy we all share of leaving behind our responsibilities and starting life anew with a clean slate. Duh. What are some memorable Simpsons alter egos? Take a look here and see some of the funniest fake names in the show's history. So enjoy this collection of the most memorable alter-egos, assumed identities, doppelgangers, and doubles from the history of The Simpsons. And remember... your name is Homer Thompson. Hello, Mr. Thompson. Episode: Season 6's "Fear of Flying"
Who is he... really? A guy actually named Guy Incognito, who is Homer's exact double. The one-time-only appearance of Guy Incognito at Moe's Tavern remains one of the greatest gags and most frequently repeated gags in Simpsons history. Here's the setup: Homer has been banned from Moe's after a prank war went one step too far. Suddenly, a man looking just like Homer, but wearing a silly mustache and speaking in a fake-sounding British accent, arrives at the bar, introducing himself as "Guy Incognito." This is one of only two mentions of Guy in the entire Simpsons canon. He appears briefly on an altered 'Wanted' poster in Springfield after the city has been covered by an impenetrable dome in The Simpsons Movie. Presumably, once more, Homer was in trouble and used the presence of his exact double to escape justice. Episode: Season 5's "Cape Feare"
"Cape Feare," in my humble estimation, may be the single best episode of The Simpsons ever made. There, I said it. Certainly, it's a top drawer Sideshow Bob episode by any standards, expanding the Sideshow Bob mythology massively in his second appearance on the show. This is the first time we see his obsession with killing Bart Simpson, and we're introduced to a number of the character's trademarks, including his lifelong love affair with Gilbert and Sullivan's operettas. Plus, it's a full-blown parody of the Scorsese remake of Cape Fear. Not bad for 22 minutes. After Sideshow Bob is released from prison and the Simpsons have started receiving death threats, they relocate to the wisely-chosen Terror Lake under the assumed name of "The Thompsons." This was chosen most likely due to the similarities with their previous name, making it easier for some members of the family to remember. Unfortunately, it still didn't work. Episode: Season 4's "Krusty Gets Kancelled"
We only get brief glimpses of the Krusty the Clown Show, and it's typically up to the audience to fill in the considerable gaps with their own imagination. Aside from the occasional bit where Krusty, say, creams a French person with pies for 10 minutes, and pauses to show Itchy and Scratchy cartoons... what actually happens during a standard Krusty episode? How much time can really be wasted throwing things at Sideshow Mel? We get some answers in the Season 4 finale, when Krusty's ratings get crushed by a new competitor, the sentient ventriloquist's dummy Gabbo. 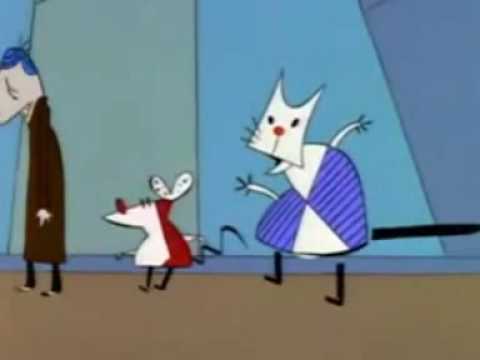 With Itchy and Scratchy moving to the newer, more popular show, Krusty is left with cartoons from Eastern Europe's favorite cat and mouse team, Worker and Parasite. Their nonsensical Communist Bloc hijinks were apparently made in 1959, if the opening credits are to be believed. Those credits, by the by, are made to look Cyrillic, but don't actually mean anything. Much like everything else in the cartoon. Episode: Season 9's "The Principal and the Pauper"
"The Principal and the Pauper" is one of the most discussed and debated episodes in Simpsons history, cited by critics as one of the first visible signs of the show's creative decline, which most agree occurred some time around the 9th and 10th seasons. It's controversial mainly because of the presence of Armin Tamzarian, which apparently, is the real name of the man we've come to know as Seymour Skinner. Apparently, Tamzarian went to war and, after what he presumed was the death of his superior officer – Sergeant Seymour Skinner – he assumed the man's life and identity, even returning to his hometown of Springfield, moving in with his mother Agnes, and becoming the local high school principal. In the world of The Simpsons, audiences accept that Bart, Lisa, and Maggie have remained the same age for decades, and that a relatively small town contains every single type of building, institution, and attraction known to man. But for some reason, fans have always had a hard time with this particular reset. Maybe it's the fact that Tamzarian is living with a woman he's pretending is his mother but who actually didn't meet him until she was an old lady... That's just kind of unsettling, reset schtick or no.